If a hunter were to forget about classifying which bow and shaft to use, then it would only leave the broadhead, as it’s the most important part when it comes to bow hunting. Today, there are dozens of manufacturers that have incorporated their own unique design and killing efficiency when it comes to broadheads for deer hunting, as well as every shot fired will result in a clean and ethical kill. The Rage broadhead has a more traditional design but different in one way. When most broadheads open up from the front then backwards upon penetrating, the Rage opens from the rear then forward. This allows the point to pierce through the deer without compromising the loss of kinetic energy and the broadhead is deployed once it hits the target. It’s not meant to be pretty, but just the same as it takes down a target with one swift kill. The Muzzy MX-4 is designed to be a perfect piercing broadhead with bleeder blades. Though the design is a bit lacking, it makes up for the way its aerodynamics likens to that of a bullet even with more powerful bows on the market. 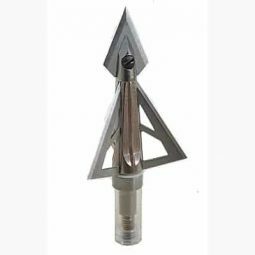 This is a great broadhead for the serious bow hunter. The Rocky Mountain Titanium 100 is similar to the Muzzy, only meaner and comes with a two or three blade broadhead. This is also a perfect broadhead of choice for the active bow hunter. And for every broadhead has to have a good shaft to screw on. Easton has been around for many years and has been a bow hunter’s favorite. The all carbon shaft may be a bit expensive, bit durable and lightweight enough to allow a more flatter trajectory without worrying About wind sheer or gravity influence. Though every design will make up for improved aerodynamics during flight, there may be some broadheads that are necessary for the kill, depending on the animal. Whitetail deer has a tendency to go ballistic once it feels something just pierced through them. Though there are other broadheads that allow a cutting motion to improve piercing, some broadheads can still be used for stunning when it comes to hunting bears. But that’s another story for another time. It takes a great deal to know some of the broadheads available on the market and the design may influence the hunting success. Though most sporting good owners will tell any bow hunter that this or that is the best, it’s better to learn the facts straight from the bow hunters themselves.